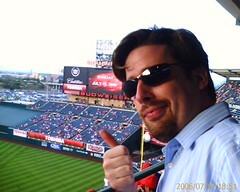 The other night I went to see the Angels play the Cleveland Indians at Anaheim with cacofunny. We had seats way up in the topmost tier, but even so it was a great scene. The whole field was easily visible, the big screen was directly across from us, and the ball park hot dogs were plentiful. It was also bobble-head night - which is a shame because apparently the previous night was tuba night, and I can only imagine that home runs on tuba night are really something to see. Apparently they've discontinued pipe-organ night, though. Shame. It was also a gorgeous night - the summer sun was just shaded by high, wispy clouds, and there was a cool breeze most of the evening. I forgot how really pleasant it is to go to a game at the ballpark - and the modern, smaller parks are even more fun than the Phillies at the gigantic Veteran's stadium of my youth. There was this really peculiar smell that kept troubling us like a noisome cloud after about the 4th inning or so. Gary and I found that we have amazing powers to bend reality - we would issue high-handed instructions to the players on the vote, motion for carrying - second, vote, and carry the motion. In each case the players complied, even to the point of smacking home a two-run homer at one point. We pledged only to use our powers for good, and never for evil. All in all it was a really cool experience, and I've got to get back out to the park again sometime soon. Or maybe I'll try and catch a Dodger's game at Dodger's stadium. Anyway. Baseball good. Though, I'm left pondering this - how come more people sang along with "Take Me Out To the Ballgame" than the national anthem? Their unwillingness to sing the anthem evinces their traitorous hearts! To the gallows, every one of them!!! They're probably rotten, lily-livered, commie-hearted demmycrats, too! Demicrats?! The gallows are too good for them. Drawn and quartered, to the man!!! How come more people sang along with "Take Me out to the Ballgame" than the national anthem? I wonder the same thing myself... DC, When the National Anthem is being performed everyone is silent, or they’ll Milli-Vanilli it. When it’s time for "Take Me out to the Ballgame" everyone's singing as if they’re trying out for American Idol. People are strange… I know the words to the National Anthem but I choose not to sing it, instead I think about those who have or currently are serving our country..
Well hell, I stand at attention and sing the song. I’m glad you had a great time. I've always wanted to go to that Anaheim Ballpark. The boy went to high school in Westminster, hopefully one day we will. They have a rally monkey! They gave me free buffalo wings! Ooh, I got your username wrong. Will fix. The problem with wearing the white hat is that sometimes you have to forego personal gratification in the name of responsibility and ethics. It's a drag, I know. Dude, I can see my house from here. Though, I'm left pondering this - how come more people sang along with "Take Me Out To the Ballgame" than the national anthem? Because the words are easier to remember and the melody is a hell of a lot easier to sing?